My workplace - an Offshore Company in Gothenburg decided to take on the renovation of the lighthouse Paternoster, residents on the island frimärksstora Hamneskär in Marstrand Fjord. The lighthouse was lifted off the island in 2002 and the horizon was not himself but the familiar silhouette. A lighthouse since 1868 shone safe passage for mariners were now in our production hall. Like a giant chemi low Paternoster nedplockad and physically, I could knock at the lighthouse. All pieces were examined, repaired (as far as it went), galvanized, painted and mounted to after three years of work remains to be a 32 meter high lighthouse. September 26, 2007 lights Paternoster again. What a feeling to stand on the rocks when the first gleam swept! It was realized early on that a lighthouse was needed in Marstrand Fjord and the best place was the island Hamneskär. The problem was that the island was too small, this could not live. Therefore mounted a lighthouse on top of Carstens fortress on Marstarndsön. But the lighthouse was on a slope so that the mariner was mistaken and thought that the lighthouse was a star. 1868 was therefore the lighthouse Paternoster on Hamneskär and three families moved out to take care of it. Four-masted, keeper and fyrbiträdets family. The work was often dangerous, often got lighthouse rescue shipwrecked. Pater Nosters second four-masted died in the tower during a guard in February 1874th Fyrbiträdet Rosendahl drowned off the island. And the women who came with out to these barren places and difficult conditions must have been something beyond the ordinary. 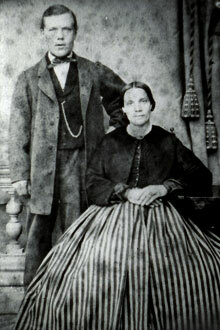 A black and white photo of first fyrvaktarparet, Olof and Johanna Andersson got me thinking. Serious and overall they look into the camera, our eyes meet through the time period. While I read about the lighthouse's history can I contact with Bertil Nilsson, living on the island of Marstrand. He turns out to be the son of one of Pater Nosters last four-masted. I ask about the lighthouse and the people who lived out there on the small island until the lighthouse was automated in 1965 and no human hand longer needed. Bertil tells about island life and about his father four-masted. Three families lived in the Port of Pink, and each family had its title in the storeroom, which during the war also received serve as shelters. That storeroom - the solid stone foundation and the red of the building in wood was interesting. What had not been able to hide in a place and what could not happen out on the isolated island Hamneskär! What if something hidden out here, which are revealed only in connection with the renovation of fyrbostäderna 2007th One of the three departments in the storeroom could be bricked again, after a body hidden in the space inside. Though if you want to hide a murder, it's easier to cut the body into the sea. While I explore Marstrand and the opportunity to talk to older generations of Marstrandsbor pops up a story. In the end, I have a history in the present and one in the past. I roll out a few feet of her son's drawing paper on the kitchen table, tape it there and start structuring all events. A timeline for the present and the past because the body is found in the storeroom appears to have been there a long time - for 40 years, believe the right doctor. But how does a body out after 40 years? Under what circumstances kept it perfectly? I will contact forensic in Gothenburg, where a forensic pathologist provides a study and take the time to answer my questions. So I sit with a manuscript that friends can read. I'll call a literary agent - Nordin Agency. They in turn will contact a number of publishers, including Dust publishers who want to publish the book. Meanwhile, turn up new ideas, new stories, and while four-masted daughter goes to press, and will book and audio book, I write on. Now the book two - Soul coffin ready to be published in May 2010. And four-masted daughter will be released in Norway, Denmark, Finland, Italy, Spain, Czech Republic, France and Germany. 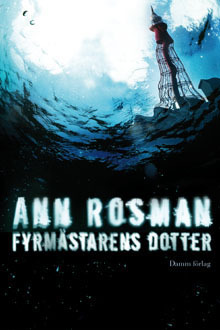 Ann Rosman resides in Marstrand. She is an experienced long distance cruiser, love Evert Taube and Bohuslän archipelago, Marstrand history and mysteries. Marstrand. A city founded in the 1100s, an idyllic island community surrounded by the salty sea and with a clear horizon to the west. The feeling it gives me is that the possibilities are endless. Especially when the sun goes down and the entire sea turned into liquid gold. Imagine all the people who trampled on the slate tiles and cobblestones in Marstrand before me! Bath attendants, waiters and errand boys. Cuts Captains and Kings. With the hope that it will drip salt water on the book. Four-masted daughter comes out in May 2009 Damm publishers. Available where books are sold, is also available as audio book and MP3.